Clockmaker by day and thief by night, Arthur Winfield is used to charming his way into the homes and pocket books of London’s wealthiest patrons. He robs the rich to fund projects designed to help those in need and uses the nobility of his goal as an excuse for the continuation of his thieving. Little does he know that his latest mark may well be his last. Lord Percival Brien’s wealth has acquired him a reputation for being one of the richest men in London. Solicited to ferret out the thief who robbed his uncle, he walks into Arthur’s shop with one purpose: divining whether or not the man he is looking for is the pretty-faced clockmaker in front of him. As he builds a friendship with Arthur, he may find that their tastes run to more intimate tracks than steam trolleys and airships. 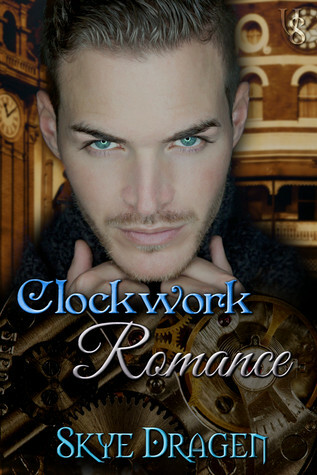 Anyway, whatever it is, Clockwork Romance by Skye Dragen [Starving Artists Ink; 2 edition, May 10, 2015] apparently is an example. Not being conversant ith these trendy labels, and even less of an adherent, I simply found it a short read – which suited my hectic schedule this week – and reasonably creative. Meanwhile, along comes Lord Percival Brien, an amateur sleuth, who is on the trail of a thief who robbed his uncle. Needless to say, Arthur and Lord Percival develop an attraction for one another, but the stumbling block is set in place when Arthur’s sideline is revealed. The story then becomes one of finding a compromise that the two men can live happily ever after with. It is a bemusing little story. The writing is smooth, and the clockmaker’s trade is one that hasn’t been used before in my experience. Four bees. Want to learn more? Then visit my new page: In Praise of Canadian History. It is a collection of people, facts and events in Canadian history, and includes a bibliography of interesting Canadian books as well. Latest post: A Tribute to the Husky Dog… An educational film made by the Province of Ontario in 1925.